My name is Derek Diamond Dust. I'm about 2-3 years old. Sometimes rabbit age is hard to tell since I was dropped off at the shelter without much information. I'm a little confused because I thought my family cared about me. I'm not letting that baggage prevent me from having another human fall in love with me though. I'm ready to move on! 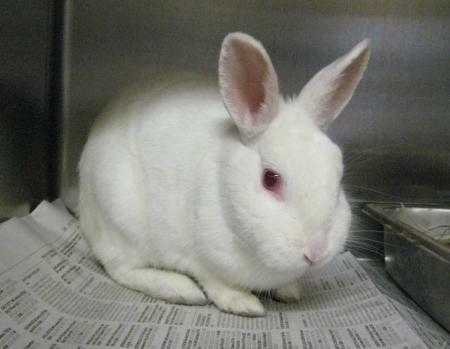 I'm a little bunny (dwarf mix) who is sweet and mellow overall. Don't let that fool you though. I do like to play and run around after I've explored my surroundings and find the setting safe and comfortable. I'm neutered already, so I'm less likely to have those bunny behaviors that people think are destructive, like nibbling on furniture legs that look like trees to me, or digging in the carpet, which feels like dirt to me. I'm working good potty training habit too. So that I can be your a good family member. I'd prefer an indoor home so that I don't have to worry about the hot and cold weather and predators that pace around my cage a night. I would really like a cozy little place to call my own.